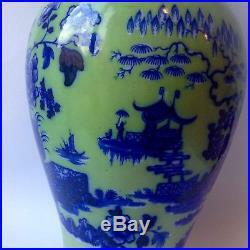 Rare and unusual very large Thomas Dimmock green ground flow blue vase – the pattern is CHINESE and it stands 13. 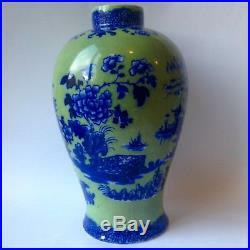 In super condition for its age with barely a mark on the ground colour – there is a teeny, flat flake chip on the base which is very minor and not seen at all unless vase is turned over. A truly stunning piece. 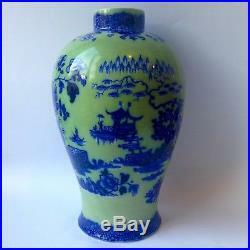 The item “RARE & BEAUTIFUL LARGE THOS DIMMOCK’CHINESE’ FLOW BLUE & GREEN GROUND VASE 1844″ is in sale since Tuesday, August 14, 2018. 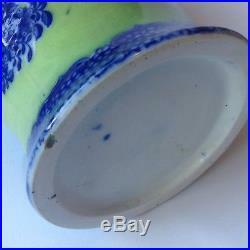 This item is in the category “Pottery & Glass\Pottery & China\China & Dinnerware\Flow Blue”. The seller is “trooper2000″ and is located in Sheffield. This item can be shipped worldwide.